NEWS STAND: Philly Cop Lied, Marion Jones on Court, JHud vs. Winnie, and more..
Straight from the Susan Smith files, a Philadelphia police officer who claimed that he was shot by a black man, lied about it. Sgt. Robert Ralston, a 21-year veteran of the department, shot himself in the shoulder so that his kids would be proud of him. Investigators questioned his story because it was clear that he was trying to make himself look like a hero. We're not sure how shooting oneself and blaming a brother is exactly heroic. Ralston has been kicked off the force. That's not the only thing that should be kicked. 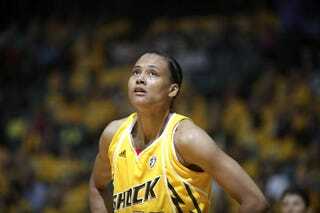 Fallen Olympic athlete Marion Jones is now playing with the WNBA's Tulsa Shock. Many have forgotten that Jones was part of UNC Chapel Hill's 1993-1994 women's national championship, where Jones played point guard. Jones can ball, but she could run too and fell victim to bad decisions. A born-again Christian, Jones plans to use this opportunity to show her fans that she has turned her life around on and off the court. We're cool with a comeback and hope that she doesn't blow this second chance at redemption on and off the court. It looks like America's favorite Dreamgirl Jennifer Hudson is facing a bit of a nightmare. Hudson is slated to play Winnie Mandela in the biopic "Winnie," based on the book of the same title by Anne Marie du Preez Bezdrob. The real Winnie Madikizela-Mandela requested that she be allowed to review and approve the final script, particularly after being pretty much erased in the film hit Invictus. The filmmakers declined her request so Madikizela-Mandela's lawyers have petitioned for an injunction. Filming is slated to begin May 31, 2010 in South Africa. If you think that's a mess, guess who will be playing Nelson Mandela? Terence Howard. Lars Vilks, the Swedish artist whose drawing of the Prophet Muhammad with a dogs body angered Muslims is in hiding after recent attacks on his life. The cartoon ran in 2007, but some Muslims are still mad about it. In addition to arson, Vilks was attacked by a man while giving a lecture at a university in central Sweden and his web site has been hacked. Vilks is now living away from his home for fear of further attacks. Some argue that Vilks' cartoon was an expression of freedom. Vilks is definitely learning that freedom of expression isn't always free from drama or danger. Sarah Palin has gotten on board of the anti-immigration bandwagon. Yes, Wonderless Woman is coming to the aid of embattled Arizona Governor Jan Brewer, whose state is being boycotted by many for its anti-immigration legislation also known as legalized racial profiling. We're not surprised that she is on board. We are surprised that it has taken her so long. Now, the Brewer and Palin are blaming President Obama for the uproar because of his failure to regulate immigration. Perhaps she should take her issue with immigration to her former running mate, Arizona senator John McCain. Oh, that's right, he was born in Panama.